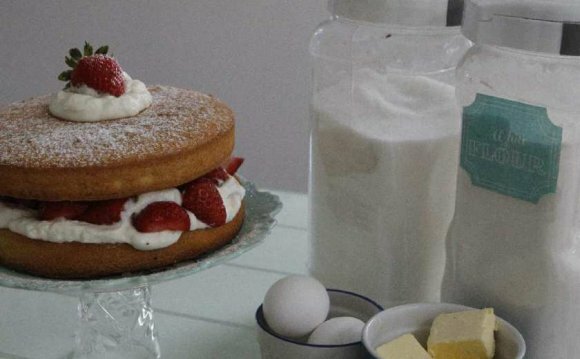 Mary Berry's quick Victoria sponge is good for serving with friends at teatime. Preheat the oven to 180°C/fan 170°C/gas mark 4. Cut 2 greaseproof report groups, grease the sandwich tins with butter and place the circles in. Grease the sectors. Place the butter in a big blending bowl, adding the caster sugar, self-raising flour and baking powder. Break the eggs one-by-one then add to the bowl. Utilising the electric mixer on slow rate, beat for just two moments until smooth. The mixture would be soft adequate to drop-off the beaters once you lift all of them up. Divide the blend similarly amongst the prepared tins and level the surfaces with a palette knife or spatula. Devote the oven and bake for 20-30 minutes. The cakes are ready when they are increased and pale fantastic. The tops should spring back when gently pressed. Cool for around 2 minutes; loosen the edges with a knife. Push the cased out of the tins on their bases, invert them and remove the basics. Cool the cakes the correct way upon a rack. Soften the jam with a palette knife.